3) Harden Off Your Seedlings: If you don't harden off your indoor seedlings before planting them outside, they will suffer shock from the brutal sun. Without the opportunity to adjust first, they'll get sunburn and might even die. In some situations this is 100% true. So you better follow this advice. ...unless you've been able to figure out some workarounds. TRADITIONALLY: To harden off your seedlings you need to slowly introduce them to outdoor light levels. Put them outside for an hour and then bring them back in. Then the next day, put them out for 2 hours. Do this for a few days and continue to slowly increase the time they are exposed to full sunlight until they are "hardened off" (capable of sitting in the sun all day long). THE CHALLENGE: Who honestly has time to mess with this? I'm sure some of us do. But it's such a pain carrying a big stack of plants in and out and in and out and... >ugh<. THE WORKAROUND: In my growing zone at 40°N latitude, I've found ways to make hardening off easier or even unnecessary. At day one I'll put the seedlings out in the afternoon, reducing their initial dose of sun. I try to pick a string of days that will be overcast. I may put the plants in a spot that gets mid-day shade. I've used a layer of netting that offers 10% or 20% shade. Then I remove the shade cloth or netting after several days. Ideally, we should be able to grow plants that are strong enough to withstand full sun without being damaged. That's where grow lights come into play. Are your seedlings thin and spindly? Excessive distance between the leaves or internodes, may be a sign of insufficient light. The resulting growth won't be adapted to the intense light levels of the outdoors. But high quality grow lights will offer a dramatic boost in light levels. Well placed T5 florescent bulbs can produce strong, dense growth. LEDs can perform just as well, or better, while using less electricity. 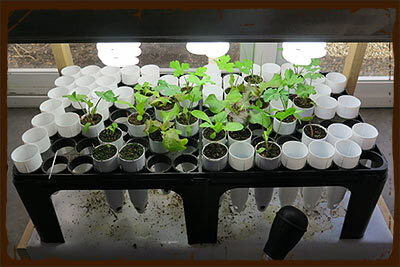 Some LED grow lights even include a UV diode to further enhance the growth spectrum. The inclusion of artificial UV light yields plants that can be placed directly into the sunlight with no hardening off. That has been my personal experience each Spring. The bottom line: You'll need to acclimate your vegetables to the outdoors. But there are short-cuts to the process. And with intense indoor lights you may find that plants are already adapted from day one!